Streptococcus pneumoniae (or pneumococcus) is a Gram-positive coccus seen in pairs, which is typically α-haemolytic, but can be variable. Streptococcus pneumoniae has a polysaccharide capsule that protects it from phagocytosis. There are over 90 highly antigenic capsular serotypes and antibodies to specific types are protective. • tissue damaging enzymes (e.g. neuraminidase, hyaluronidase). Humans are the only host of S. pneumoniae. Carriage, which is usually asymptomatic, is most common in the young or smokers and is associated with overcrowding. Serotypes vary with country, time and subject group. Children under 1 year of age are vulnerable to acute pneumonia. Complement deficiency, agammaglobulinaemia, HIV infection, smoking, alcoholism and splenectomy predispose to severe infection. The bacteria are able to adhere to pneumocytes and invade the bloodstream by hijacking the platelet-aggregating factor receptor pathway and produce complement-mediated damage to the alveolus through the action of pneumolysin. • Acute otitis media, sinusitis and acute pneumonia are the most common infections. • Pneumococci cause between 50 and 75% of cases of community-acquired pneumonia, up to 25-30% of which may develop bacteraemia. • Bacteraemia is an important complication with a high mortality, despite treatment. • Direct or haematogenous spread can give rise to meningitis, which has a high mortality and is associated with brain damage. 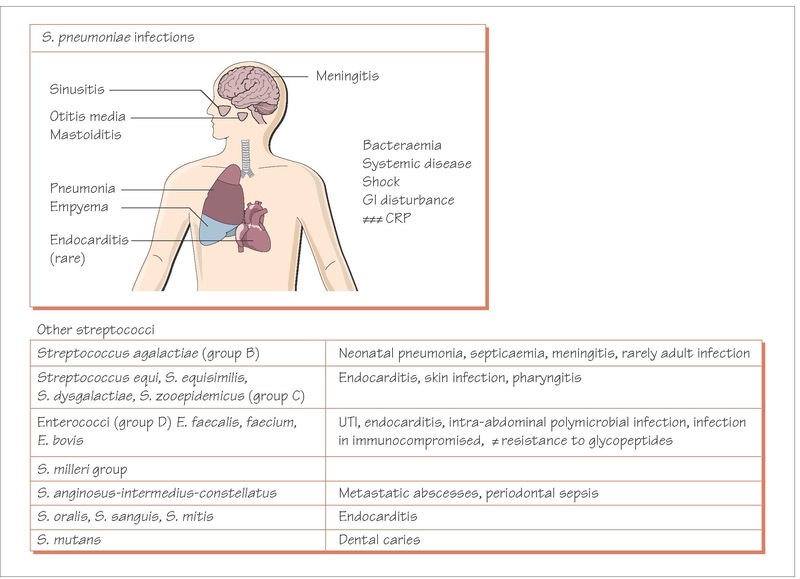 This is now the commonest cause of meningitis in adults over 40 and the second commonest cause in children from populations that have been vaccinated against Haemophilus influenzae type b (Hib). • Pneumococcus rarely causes cellulitis, abscesses, peritonitis and endocarditis. • The mortality and incidence of sequelae are high. Once universally susceptible to penicillin, significant numbers of S. pneumoniae have developed resistance through a genetically modified penicillin-binding protein gene,and penicillin-resistant clones have spread internationally. S. pneumoniae is also susceptible to erythromycin, cephalosporins, tetracycline, rifampicin and chloramphenicol, but multiple drug resistance is growing. Penicillin is the treatment of choice for respiratory infection but third generation cephalosporins are used for meningitis if it is caused by less sensitive strains. Where high-level penicillin resistance occurs, a glycopeptide (usually vancomycin) should be added. A conjugate vaccine incorporating up to 13 capsular serotypes has been introduced and is highly immunogenic in young children. Whilst this has led to a decline in invasive pneumococcal disease in children and adults, there is some evidence that serotypes not included in the vaccine are increasing. There are a wide range of streptococci found in the oropharynx, which can occasionally cause disease. Some of these species are closely related to S. pneumoniae. The α-haemolytic streptococci (S. oralis, S. sanguis, S. mutans and S. salivarius) cause 40-60% of community-acquired native-valve endocarditis. Infection may be of dental origin; while good evidence is lacking, prophylaxis is recommended for at-risk patients undergoing bacteraemia-inducing dental procedures such as extraction or deep scaling.Streptococcus bovis bacteraemia and endocarditis is associated with underlying bowel malignancy. Occasionally endocarditis is caused by nutritionally deficient (pyridoxine-dependent) streptococci that can be missed on culture. The ‘Streptococcus milleri’ group of organisms (S. anginosus, S. intermedius and S. constellatus) colonize the mouth and gut. They are sometime responsible for metastatic infection, causing brain, lung or liver abscesses often as part of a mixed infection with obligate anaerobes. Isolation of a member of the ‘S. milleri’ group should prompt a thorough search for an occult abscess. A number of other Gram-positive cocci such as Leuconostoc and Pediococcus are occasionally associated with infections, particularly in immunocompromised individuals. Alloiococcus otitidis is a slow-growing Gram-positive coccus that produces lactic acid and has been associated with chronic otitis media with effusion in children, particularly in the chronic phase although its pathogenicity is not certain. This organism is genetically closely related to S. pneumoniae but does not have a capsule and may lack some of the common patho-genicity determinants. It has been associated with isolation from patients with chronic obstructive pulmonary disease.